Franks For The Treats - Trick Or Treat All Through The Year This item is on sale. FROM STORE OVERSTOCK, NEVER USED...From Cherrywood Design Studios and the 5th in their 2012 Trick Or Treat All Through The Year Series! Shown on 30ct Carrot linen using Crescent Colours and Gentle Art Sampler Threads; embellished with buttons from Just Another Button Company. **Join our club and get each bit of Halloween fun as soon as it's released! Free Flying Lessons This item is on sale. FROM STORE OVERSTOCK, NEVER USED...From Sue Hillis, stitched on 28 count white fabric using DMC floss. Stitch count is 50 x 71. Freedom House - Punch This item is on sale. FROM STORE OVERSTOCK, NEVER USED...From Waxing Moon Designs, chart is in EXCELLENT condition, with no markings of any kind and price stickers on protective plastic cover. Preprinted Weaver's cloth is included. French Country - Bistro This item is on sale. FROM STORE OVERSTOCK.....From JBW Designs, and shown stitched on a prefinished Blue Toile/Ticking Apron with a 27 Ivory linen insert. Uses DMC floss with a stitch count of 121 x 50. Would also make a charming framed piece, using small brass hooks at the base of the frame to hold keys, etc. French Country - Elephant This item is on sale. FROM STORE OVERSTOCK...From JBW Designs, shown stitched on 28ct rench Striped linen from Fabric Flair with a stitch count78 x 95. The Blue version was stitched using Weeks Dye Works Capri; the Pink version with Classic Colorworks ladybug. The chart includes alphabets for a baby's or child's room. French Country - Fruit This item is on sale. FROM STORE OVERSTOCK, NEVER USED...From JBW Designs, go a bit fruity with these designs! Shown on 28ct Stone linen, the Cherries have a stitch count of 39 x 55 and use Crescent Colours (Pablano Pepper, Weeping Willow, Secondhand Rose, Apple Fritter, Bing Cherry & Brown Sugar). The Grapes use Weeks Dye Works(Peoria Purple, Lilac, Citronella, Scuppernong & Swiss Chocolate) with a stitch count of 45 x 56. French Country - Hot Air Balloon This item is on sale. French Country - Poodle This item is on sale. 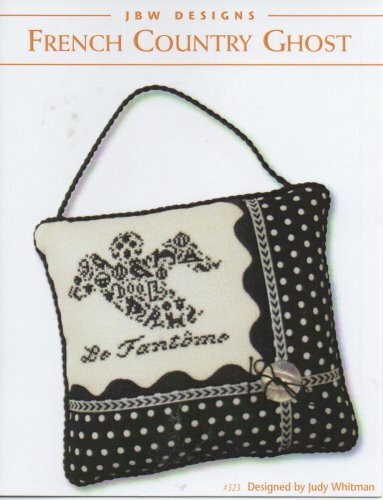 FROM STORE OVERSTOCK.....From JBW Designs, stitched on 32 count French Polka Dot from Fabric Flair using Crescent Colours. Stitch count is 48 x 69. French Country - Rabbit This item is on sale. FROM STORE OVERSTOCK, NEVER USED...From JBW Designs, chart is in EXCELLENT condition, never used, with no markings of any kind and price sticker on front cover. French Country - Santa - La Pere Noel This item is on sale. FROM STORE OVERSTOCK, NEVER USED...From JBW Designs, shown stitched on 32ct French Polka Dot linen using Classic Coloworks Ribbon Red & Schoolhouse Red from The Gentle Art (or DMC 321 & 304). Stitch count is 53 x 107. Both versions are shown finished: one with a pulled thread edging and made into a sweet little bag; the other has been mounted on a red wooden hornbook. French Country - Umbrella This item is on sale. FROM STORE OVERSTOCK.....From JBW Designs and perfect for a wedding OR baby shower, this design was stitched on 32 count French Polka Dot from Fabric Flair using Crescent Colours. Stitch count is 57 x 73. French Country - Wedding Cake This item is on sale. FROM STORE OVERSTOCK.....From JBW Designs, stitched on 32 count French Polka Dot linen from Fabric Flair using Crescent Colours. Stitch count is 62 x 70. French Country Bicycle This item is on sale. French Country Black Cat This item is on sale. FROM STORE OVERSTOCK, NEVER USED...From JBW Designs, shown on Cream/Ivory Linen (or Aida) with a stitch count of 53 x 5, using Gentle Art Sampler Threads - Onyx. French Country Crow This item is on sale. FROM STORE OVERSTOCK, NEVER USED...From JBW Designs, shown on Cream/Ivory Linen (or Aida) with a stitch count of 62 x 72 using Gentle Art Sampler Threads - Onyx. French Country Ghost This item is on sale. FROM STORE OVERSTOCK, NEVER USED...From JBW Designs, shown on Country French Latte Linen (or Aida) with a stitch count of 71 x 57 using either Weeks Dye Works Mascara OR Pumpkin. French Country Sampler This item is on sale. FROM STORE OVERSTOCK, NEVER USED...From Rosewood Manor, stitched on 28 count Antique White Cashel linen using Weeks Dye Works. Stitch count is 168 x 138. French Country Snowflake This item is on sale. FROM STORE OVERSTOCK, NEVER USED...From JBW Designs, the first is stitched on 32ct Natural with White Dots linen using GAST Cherry Wine and finished as a standup box; the second was stitched over one on 28ct Antique White linen using Classic Colorworks Wavy Navy and mounted in a Lone Elm Lane pincushion box, embellished with JABCo pins; the third version is on 32ct Blue Spruce linen using Weeks Dye Works Snowflake and finished as an easel. The stitch count is 58 W x 68 H with the lettering; 48 W x 57 H without. French Country Stork This item is on sale. FROM STORE OVERSTOCK, NEVER USED...From JBW Designs, and released as a baby/childrens design which can be personalized with names and date. Shown finished as flat hanging pieces, the stitch count is 61 W x 85 H. Shown stitched on 32ct French Polka Fot linen , a complete alphabet including numbers is included. Fresh Mesh - Beach Tote & Clutch This item is on sale. FROM STORE OVERSTOCK, NEVER USED...From SamSarah and shown stitched on a bright lime green Nylon Mesh Tote and Clutch Case using 3-ply of Crescent Colours, Sampler Threads and Weeks Dye Works (or DMC floss) The nylon mesh is so stable you do not use a hoop or frame of any kind - just don't pull stitches too tight and keep the back of your stitching tidy. Fresh Mesh - Monogram Tote & Clutch This item is on sale. FROM STORE OVERSTOCK, NEVER USED...From SamSarah and shown stitched on a black Nylon Mesh Tote and Clutch Case using 3-ply of Crescent Colours, Sampler Threads and Weeks Dye Works (or DMC floss) The nylon mesh is so stable you do not use a hoop or frame of any kind - just don't pull stitches too tight and keep the back of your stitching tidy. "Hip To Be Square" is 88 x 54; "Here We Go Round In Circles" is 76 x 30. Dirctions for making your own monogram buttons (easy peasy!) are included! Fresh Mesh - Santa This item is on sale. From SamSarah .. Santa has "Jazz Hands"! Shown stitched on a bright royal blue nylon mesh tote bag and/or clutch bag, the stitch count is 106 x 55 for the tote; 78 x 28 for the clutch. Uses Crescent Colours, Weeks Dye Works, Gentle Art Sampler Threads or DMC floss. Friday Night - A Day At Home This item is on sale. FROM STORE OVERSTOCK, in EXCELLENT condition, never used. From Samsarah and 1st in her "Home" series. Each kit contains the chart, Crescent Colours floss and exclusive accoutrements. You choose the linen (shown on 30ct Blue Jean linen) and frame (shown in a 6" x 6" tray from East Side Moulding). Friends & Neighbors This item is on sale. FROM STORE OVERSTOCK, NEVER USED, chart is in EXCELLENT condition...From Morningstar Embroidery Group, stitched on 28 count fabric of your choice using DMC floss. Friends Are Flowers This item is on sale.